The best Total Eclipse Guide for Ohio Start planning today for your Total Eclipse Experience. On April 8, 2024, a remarkable event will occur over Ohio. A rare total eclipse will pass directly over the state. 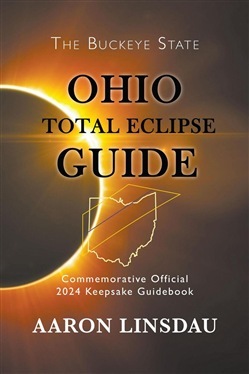 If you are planning to view the total eclipse in Ohio, you need the Ohio Total Eclipse Guide. This book has everything you need to know about viewing and photographing the eclipse across the state. In it, you will find some of the secret locations locals know. Why Buy the Ohio Total Eclipse Guide? Where should you watch the eclipse from? How will you find these locations? If you have never been to Ohio before, you might get lost. You don't want to be lost on the big day of the eclipse! The book even will tell you exactly where to stand if you want to see the eclipse directly over Ohio. This commemorative official guide has information on lodging, travel and local secrets. Photography The book contains photography exposure settings for your camera. If you're interested in creating a stunning photo of the sun's corona, the book tells you the aperture, shutter speed, and ISO settings you'll need. You will find a wealth of information about how to safely and successfully photograph this rare total eclipse that will traverse the United States. Guides for the Fourteen States Under the 2024 Total Eclipse See other state eclipse guides, purchase wholesale or signed author copies at the publisher website for Sastrugi Press. If online retailers are out of stock, purchase directly from your local bookstore. Acquista Ohio Total Eclipse Guide in Epub: dopo aver letto l’ebook Ohio Total Eclipse Guide di Aaron Linsdau ti invitiamo a lasciarci una Recensione qui sotto: sarà utile agli utenti che non abbiano ancora letto questo libro e che vogliano avere delle opinioni altrui. L’opinione su di un libro è molto soggettiva e per questo leggere eventuali recensioni negative non ci dovrà frenare dall’acquisto, anzi dovrà spingerci ad acquistare il libro in fretta per poter dire la nostra ed eventualmente smentire quanto commentato da altri, contribuendo ad arricchire più possibile i commenti e dare sempre più spunti di confronto al pubblico online.